Campaign Office @ 2858 Lake Shore Blvd. W.
Our campaign office is up and running at 2858 Lake Shore Blvd. W.! We are at Lake Shore and 5th St.
Drop in any time for a coffee or tea, to talk about the issues, to volunteer or donate, or to sign up to get a small or large election sign for your window (pictured here) after October 2nd! 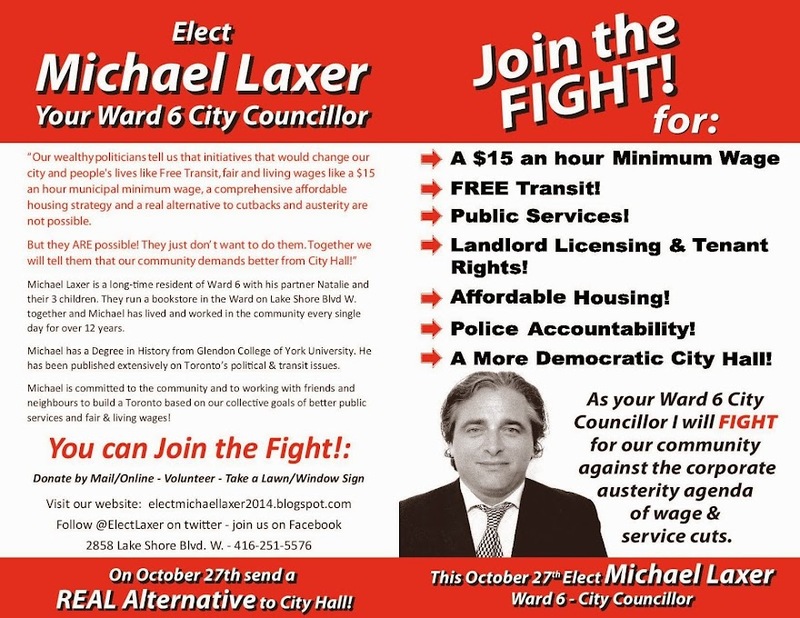 We can also be reached by phone at (416) 251-5576, by email at electmichaellaxer@outlook.com, or via the "Contact Us" field on the website's sidebar. Which side are YOU on? Living wages in Toronto...or poverty wages? So...which side are YOU on? Living wages or poverty wages? We know the answer...you want workers in your community to earn a living wage, not a poverty wage, for their work. But Toronto's politicians don't want to talk about a real living municipal minimum wage. A $15 an hour municipal minimum wage. They want to tell you it can't be done...even though it can! They want to continue with business as usual..which means business paying poverty wages to many Toronto workers! Ask your candidates for Council or Mayor which side they are on. Poverty wages or living wages? And when they say it is not a municipal issue...tell them that YOU are going to make it one! 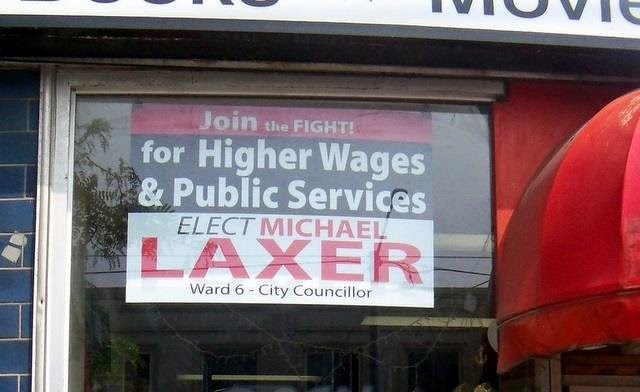 Michael Laxer Campaign Summer Get-Together! Where: The Big Guy's Little Coffee Shop - 2861 Lake Shore Blvd. W.
Sunday, August 17th join us in the heart of New Toronto & Ward 6 at The Big Guy's Little Coffee Shop at 2861 Lake Shore Blvd. W for a campaign buffet & social. Michael will be serving up BBQed meat & veg, sandwiches, drinks & more including many of his faves from his food blog! There will be vegetarian & vegan options. The first part of the event starts at 2 p.m., when we will be heading out to drop/canvass local streets with our message of higher wages, public services & free transit! But this part is optional. The social starts at 4:30 p.m. Everyone is welcome (whether you were able to canvass or not) so join us for terrific food & discussion. Bring the kids! The event is free to attend, as is the food (although campaign donations & donations towards the food will, of course, be welcome! ). Drinks & coffee will be available for purchase. 99 days to go until the election! Since January 3rd we have been campaigning on a platform of real change and optimism and on ideas like free transit, municipal minimum wages, landlord licensing & more! Together we can build and work towards these real alternatives and changes, despite what the do-nothing politicians say...and we know this because it is happening elsewhere! All of my other platform ideas can be found at the top of this webpage, and if you have any ideas or questions you can contact me at any time or come out to one of my monthly events. 99 days to go! 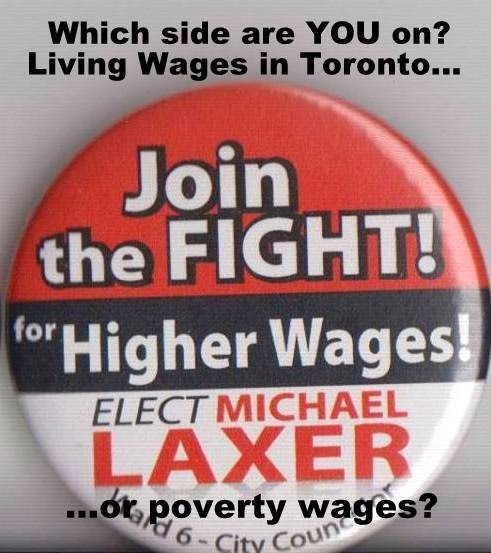 Let's use them to fight together for a Toronto built on economic justice and comprehensive public services! In the Fight Against High TTC Fares We Need a Universal Fare Reduction Strategy! Yesterday, Toronto City Council voted to "study" the idea of a separate "low-income" "fare equity" plan for the TTC. But I believe that this is the wrong way to go and wrote an article saying why and outlining why means test based programs like Toronto's "Welcome Policy" are not an alternative to actually working to lower fees and fares for all, even for those they are supposed to help. From "Toronto's transit woes: Are 'fare equity' policies a real alternative to universal fare reduction strategies?" The problem with rising TTC fares is not simply or only that some are being left behind by their increase, it is that they keep rising! The political will to fight fare increases simply does not yet exist and politicians act as if the increases are inevitable and need to be mitigated when they are not inevitable and only need to be mitigated because they have risen for a generation and have assumed an absurdly large role in financing the system. The fares are not affordable because they are too high. Exempting some portions of the Precariat, those living in poverty and those who fall under some arbitrary line drawn up by city officials will not change the fact that the fares are too high! While one has to be sympathetic to those fighting for this idea, one also has to ask, would not the money, time and political effort simply be better spent on an across the board fare reduction strategy that does not require any administration, means tests or fare policing and that would then fit into a broader strategy of working towards the goal, already achieved in cities like Tallinn, Estonia, of free and affordable transit for everyone?"